Dimensions 44" H. x 14" W.
Overall Condition Fair to Poor Most ofour pieces have spent decades on at least two continents, and have been treasured by several owners. 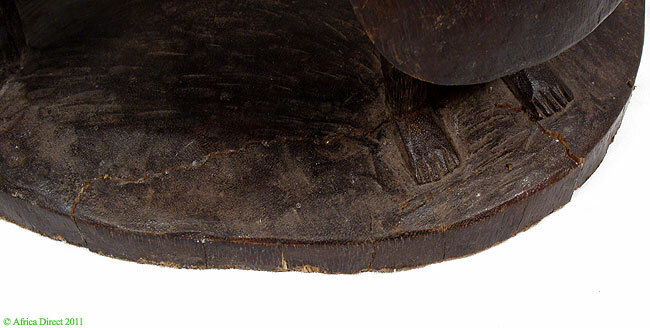 Small splits, scrapes and cracks are a normal part of their patina attesting to their age and extensive use. We examine each piece carefully when we receive it and report any damage we find in our listings. Please look carefully at the pictures which may also reveal condition and damage. Damage/Repair One bird on top has broken legs. Base has been repaired. Horse ont top has large crack fairly repaired. cracks in lid and rim of bowl. Additional Information: A wonderful carved bowl with lid. Four figures of balaphon players support the large bowl. The bowl itself is decorated with two mask dancers and two baffalo figures in relief. 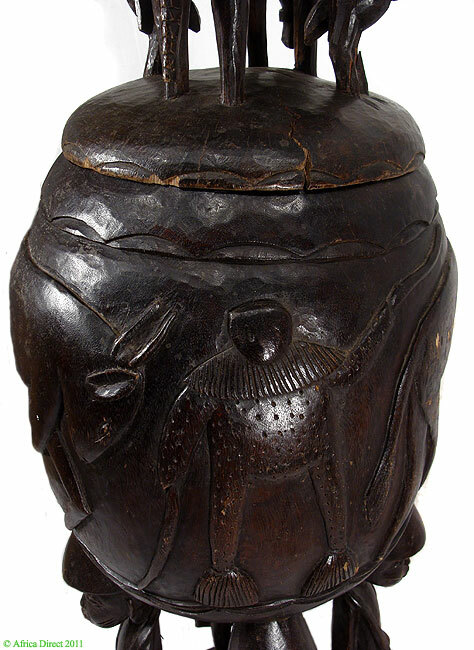 A figure of a horseman and two horn-bill figures stand on the top of the lid. This large bowl comes from the Senufo people. 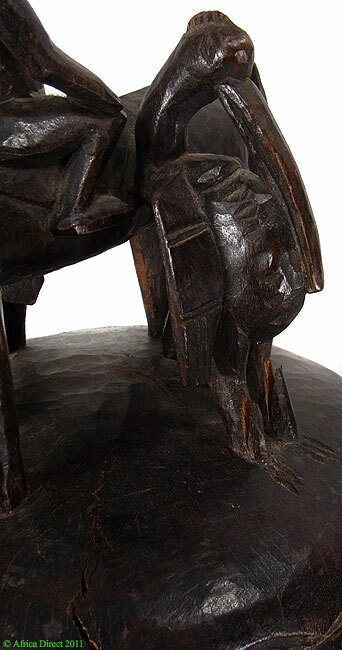 The figures have the hallmarks of classic Senufo sculpture in terms of details and style and imagery in association with figures. The bowl could have served as a container and used for various ceremonies. It was probably used as a utensil commissioned by a priest to carry magic objects or ingredients used in rituals. 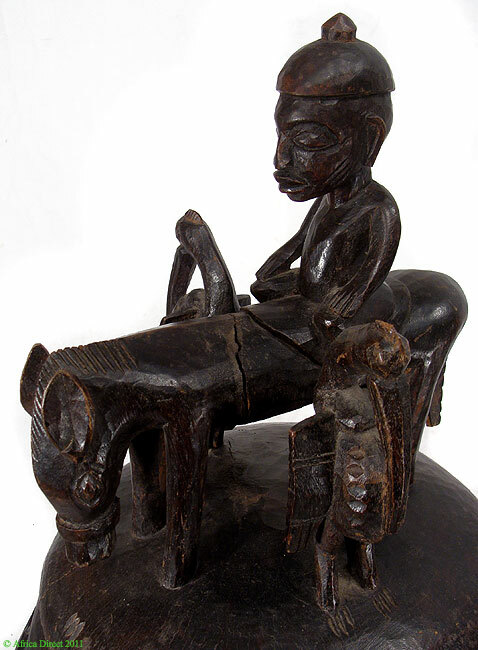 Whatever its use and ceremonial appearance this object is a beautifully carved figure which reflects the skill and aesthetic sensibilities of the Senufo carver. Glaze, Anita J. 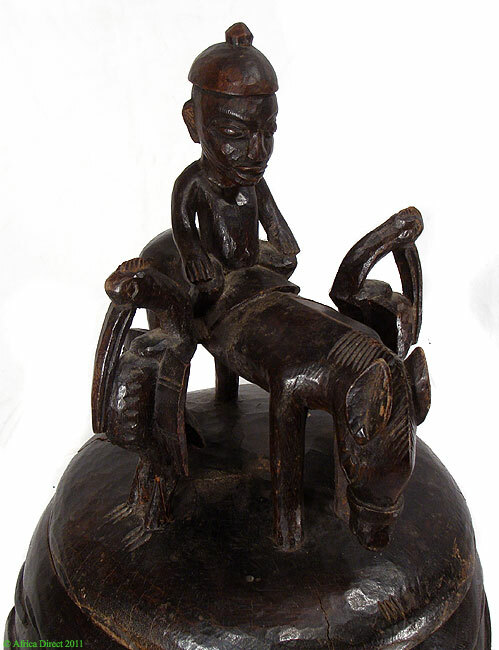 “Art and Death in a Senufo Village. 1981. 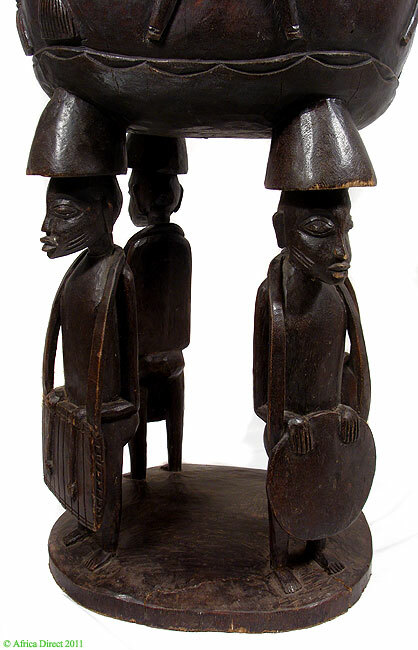 Forster, T. Die Kunst Der Senufo, Museum Reitberg, Zurich. 1988.